The husband-wife worship team’s national debut album, All You’ve Done, produced by Josh Silverburg, will be released on June 2nd. 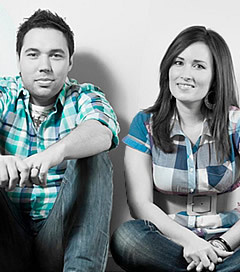 (GRAND RAPIDS, Michigan) — Discovery House, a division of Our Daily Bread Ministries, is pleased to announce the signing of husband and wife worship duo Brad + Rebekah. The pair will release their national debut album, All You’ve Done, produced by Josh Silverburg (Michael W. Smith, Bellarive, Newsboys), on June 2, 2015.